It’s spring here in Australia, and with spring comes flowers. Not that there aren’t some things (trees, bushes and flowers) blooming in winter, but now, there are more. And one of the latest areas for spring blossoms to come to Australia seems to be the capital, Canberra, which is in a ‘cool climate’ according to the winemakers. Cool, not cold, according to anyone who has spent any time in Canada. 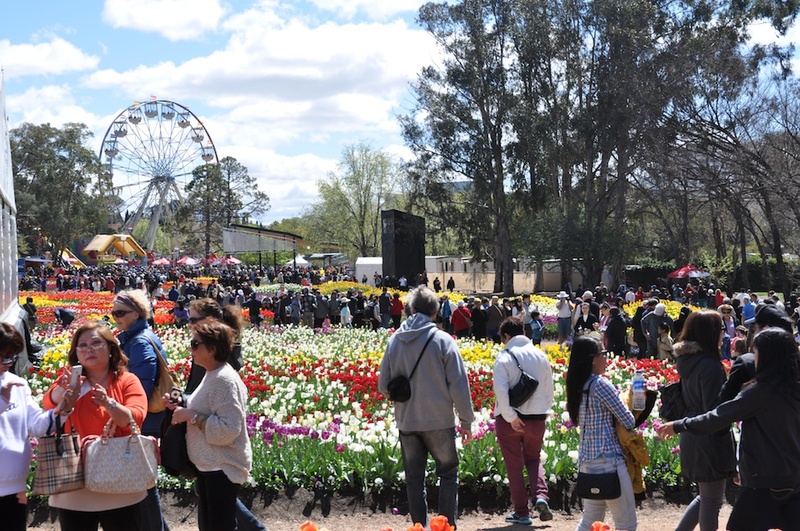 And so even though it is a bit behind Wagga, this past weekend was the middle of Floriade, a month-long flower festival in Canberra, celebrating, it seems, tulips. We went, sort of by mistake. A few weeks ago, we decided to plan a trip to the capital. We haven’t been there together in a while, and there were a couple of attractions we wanted to take in; Lisa wanted to go to the Handmade Markets (something like the One of a Kind markets in Canada) and Dan wanted to see the Abstract Expressionism show at the National Gallery. And we wanted to take our bikes and cycle around Lake Burley Griffin and Ginninderra Lake. Little did we know that these inauspicious plans put us in the city on same weekend as Floriade, the Murrumbateman wine show and moveable feast, the Labour Day long weekend, and footy finals. Every good festival needs a king and queen. 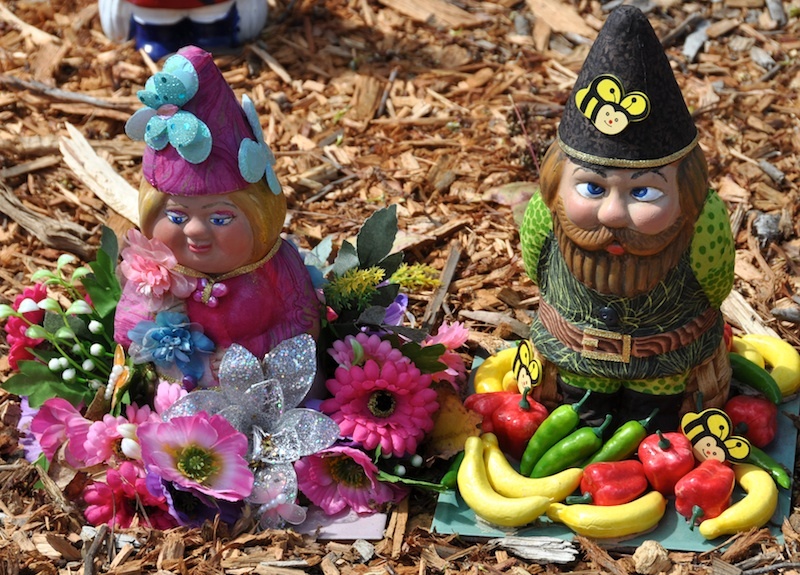 These two were crowned at Floriade. So, how did all these things go together for us? Driving to Canberra, we stopped at a couple of wineries in Murrumbateman, a small town about 28 km north of Canberra that is the heart of what is referred to as the Canberra Wine District. Murrumbateman gets hosed on this because there aren’t actually any wineries in Canberra and none of the other towns nearby with wineries (Hall, Gundaroo, Lake George) make plonk of the quality found in Murrumbateman (arguably the best shiraz and riesling in the country). Not knowing that there was a wine event on, we were lucky that we went to Helm and Eden Road on Friday to beat the crowds. On the way home on Sunday, we stopped at Clonakilla and it was crazy…maybe 10 people tasting, which is about 10 more than normal! So even though we didn’t get to the Murrumbateman wine show this year, we are thinking we might work it into our schedule for next year. We’ll have to book accommodation well in advance though, because (as the locals mentioned to us) there aren’t many good places to stay or eat there; it’s just too close to Canberra. All these people rushed to Floriade in the morning so they could watch footy in the afternoon. Footy finals…well, we don’t know enough about AFL or NRL to care, but we did see a lot of people wearing team colours. And, a really great beer store we went to (Plonk – a REALLY GREAT beer store) was having a sale on Sydney and Hawthorn beers (the two teams playing in the AFL finals on Saturday). Other than that, we listened to a bit of the NRL final on the radio while driving home on Sunday evening, but determined that sport on the radio works best when 1) it is a slow sport and 2) you know at least the basics of the sport. It was entertaining in a weird ‘let’s listen to a whole new world of sports lingo clichés’ way, but we have no idea what happened. Other than some guy bit another player’s ear. The fact that it was a long weekend was just a bonus that we realized after the hotel, restaurants and cat sitter were booked, as we were planning on getting home late Sunday. This gave us a day at home to catch up on chores, do some gardening and go biking. 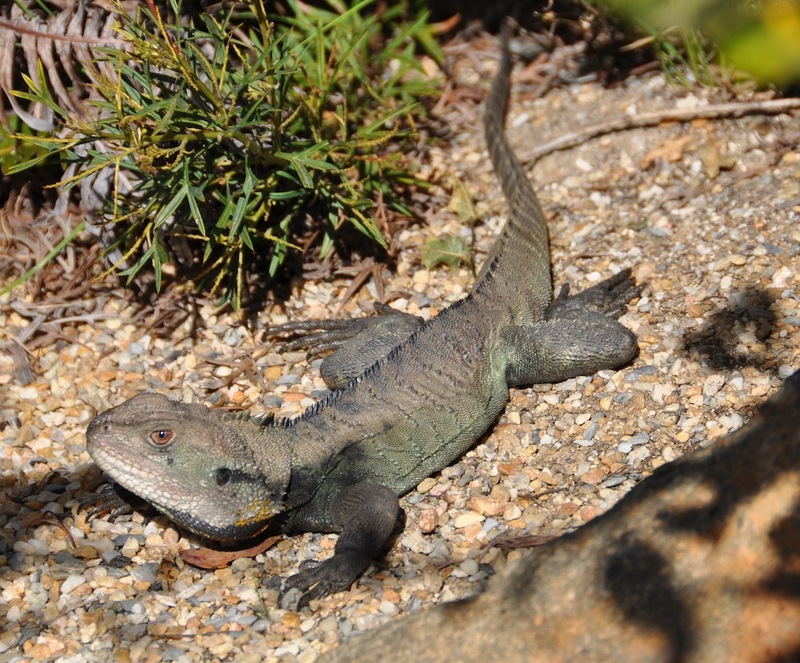 This water dragon wasn’t too interested in footy; he was tanning at the botanic garden. In the end, we pretty much did just what we had originally planned: the show at the National was a bit disappointing…not bad, but we’ve seen so many good and great exhibitions of these artists (Pollock, Krasner, Rothko, Guston, etc) that this one, of works owned by the National Gallery of Australia, was just OK. But we did tour the Aboriginal galleries (had been closed when Dan was there a few months ago) and they are pretty spectacular, definitely worth seeing. Handmade Markets were fine…Dan didn’t hate them as much as he thought (and as much as the woman running the Eden Road cellar door said he would) because there were people selling interesting food. He also got some really funky beer glasses. The third thing on our list (the cycling) got scuttled by the weather – the forecast was so horrible we didn’t even take them. In the end, it wasn’t really bad, but quite rainy on Friday and both Saturday and Sunday mornings were pretty frosty. So the cycling got replaced with Floriade and a trip to the botanical gardens. 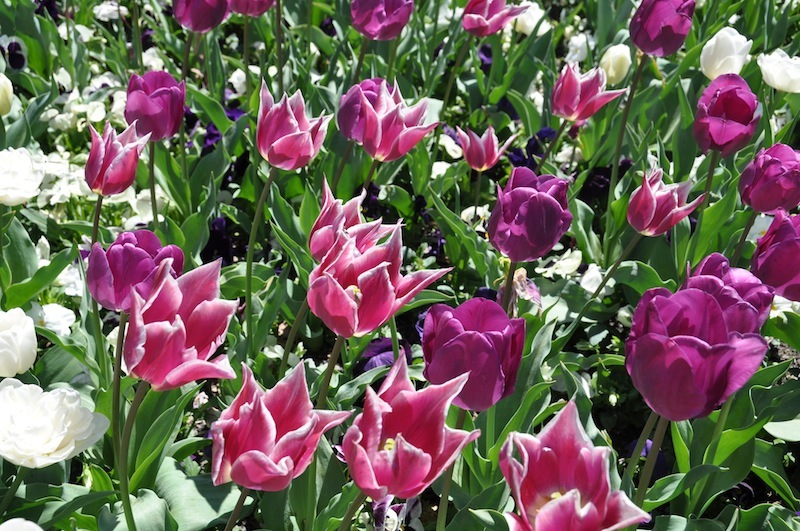 Floriade…whatever, you’ve seen one tulip, you’ve seen them all (think “Ottawa Tulip Festival” but on a smaller scale). The botanical gardens, however, were a treat. Lisa had been here before and knew that it was a great place for bird-spotting and to check out the native plants. We stumbled upon the 2pm tour group and the guide (after spotting Lisa’s binoculars and bird book) offered to show us a few hard-to-spot species. How exciting! We were able to add the tawny frogmouth and satin bowerbird to the list, as well as a male and a female gang-gang cockatoo flying overhead. GL – if you’re reading this – we’ll do our best to spot the frogmouth on your next visit; we now know the location of the tree where they nest. 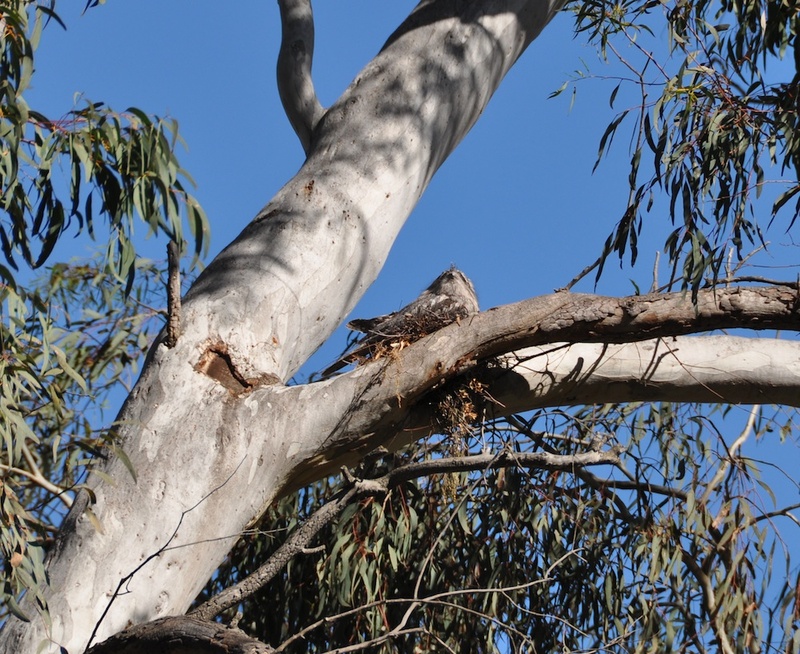 Frogmouths are very good at hiding in trees…this is the male, who sits on the nest during the day. The female was a branch or two away and even harder to spot. While the gang-gang and the frogmouth are both interesting (especially the latter…see photo), the bowerbird is a cool story worth telling. They make bowers, these nest-like items on the ground (not their nests, which are in a tree) to attract a female. Basically a pile of sticks, that always faces north/south (unless it is a bowerbird in a different part of the country which does an east/west bower) around which they place blue things. Yes, whatever blue things they can find. So the gardens had to replace the blue ribbons they used to mark trails with yellow ribbons, because the bird who moved into the park kept stealing them for mating purposes. Unfortunately, both the bird and the bower were too well concealed for a good photo. This entry was posted in birds, Canberra, festivals, footy, labour day weekend, market, wine. Bookmark the permalink.